After an active day of sightseeing, you will probably appreciate to relax in our hammam under sensitive and professional hands. Moroccan massage, made with the highest quality essential oils, will ease away your daily stress and have a positive and therapeutic effect on your body and your mind. We can provide you a private guide speaking your language who will let you discover the most significant sites of the medina. Being escorted by an official guide who knows perfectly the city has the advantage of not loosing time and not being bored by intrusive self proclaimed guides who show up at every street corner. Half-day tour is rated as few as 25 € and a full-day tour will cost you 40 €. 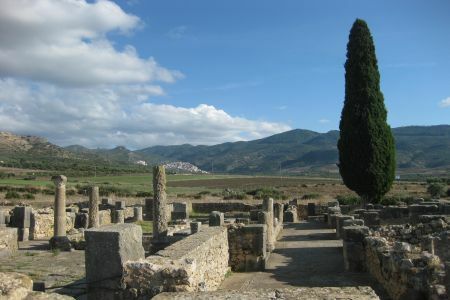 This full day tour will let you discover the hilly landscape of Saiss and the Roman ruins of Volubilis, a city at the foot of the Rif Mountains which has been inhabited until the 3rd century A.C. You will there admire mansions, amazing good preserved mosaic floors, the Capitol, the monumental Arch of Caracalla and corinthian columns and you'll get a real sense of Roman lifestyle. A guided tour of the Volubilis site with an official local guide is well worth it if you are interested in some informations about the site's history. You will then leave Volubilis to Moulay Idriss, the holiest islamic town in Morocco where thousands of pilgrims come every August to pray at the tomb of this saint, grandson of the Prophet Mohammed. 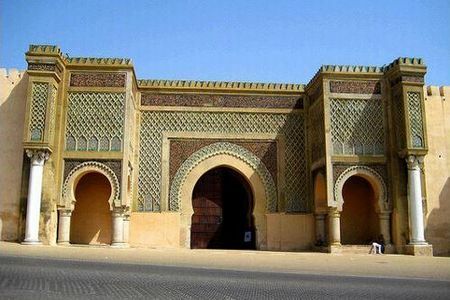 You will then head to Meknes which has been Imperial City in the 17th century under the reign of Sultan Moulay Ismail. You will there visit one of the most beautiful city gate of Morocco, the Bab Mansour. From here to the Mausoleum of Moulay Ismail and the Rouah, the stables for his over 12,000 horses.Time for lunch before leaving Meknes around 4:00 in the afternoon, arriving back in our riad at around 5:30. Price: 75 € for 2 people, 100 € for 4 people. This day tour will bring you to Ifrane and Azrou and let you breathe the fresh air of the Middle Atlas. Covered with forests of oaks and cedars, this region is little-visited by tourists but is on the contrary much appreciated by Moroccans who find the european looking cities "exotic". 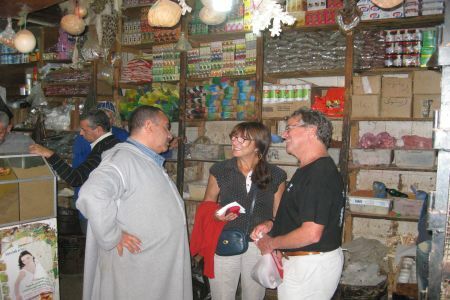 You will first pass Imouzzer then Sefrou, a small animated town with a lovely market 30 Km from Fes. Ifrane, a famous mountain resort, is a little town with an european alpine style and the houses will let you feel like in Switzerland. Azrou, an interesting berber settlement, surrounded by beautiful cedar forests with giant trees populated by monkeys, a sort of Barbary Macaques. Each Tuesday there is a animated market in Azrou with a large variety of goods, both traditional (like carpets) and contemporary items, a popular past time for tourists hunting for a bargain. 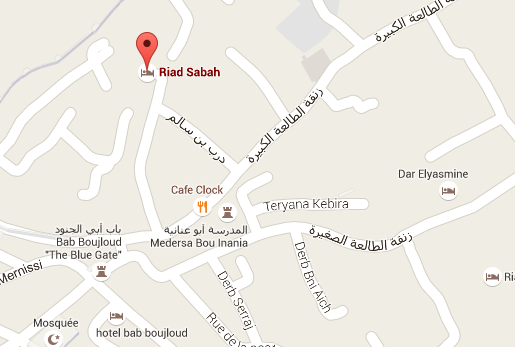 Departure from riad: 9:30, arrival 5:00pm. This 2 days tour will let you discover the Rif Mountains and Chefchaouen which is known as the "blue" city in northwest Morocco, founded by arabic exiles from Andalousia in the 15th century. Chefchaouen is also a popular shopping destination as you can find there beautiful handicrafts that are not available elsewhere in Morocco, especially woven wool blankets and djellabas. After breakfast, departure from Fez crossing the famous Rif Mountains which has the reputation of beeing the main place of cannabis production in Morocco . Arrival in Chefchaouen at 12:30. Lunch. You will spend the rest of the day exploring this charming and unique town with its blue-painted houses and streets. In the center of the medina is Plaza Uta El Hammam, a lovely square lined with cafes and restaurants where you will rest and have dinner. From there you will see the Kasbah (walled fortress) which contains beautiful gardens and a small museum. Overnight in a hotel or riad. In the morning, you can climb the hill which overlooks the town (there is a hotel at it's top) and you will there enjoy an amazing overview of the city with its colourful houses. After exploring the medina, visit the nearby hills and the Talassemtane National Park which is situated just outside of the town, home of beautiful forests and waterfalls. Enjoy then your lunch at one of the terraces of a restaurant at the main square. 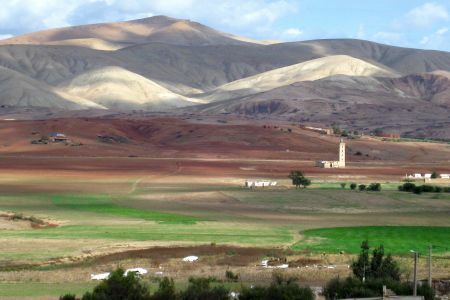 At 4:00pm, return to Fez through the Ketama region, the heart of the Rif, and Taounate. Price: 400 € for 2 persons, 550 € for 4 persons. 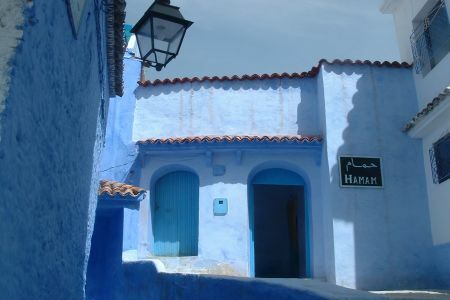 It is possible to make a single day tour with departure at 8:30am after breakfast and arrival at noon in Chefchaouen, free visit of the city until 4:30pm then back to Fez and arrival at the riad at approx. 8:00pm. Price: 150 € for 2 persons, 200 € for 4 persons. Visit in a one day trip the hot springs of Moulay Yacoub, a small Berber village 21km northwest of Fez at the foot of the Rif mountains. The springs of Moulay Yacoub with their sulfurous waters are known since ancient times for their healing effect. You will be introduced into a modern and clean thermal spa where the very helpful and friendly staff will look after you. You will have access to the pool where the sulfurous water is very hot and salty. Sulfurous waters are known as especially effective against rheumatism, joint pains and some skin diseases. 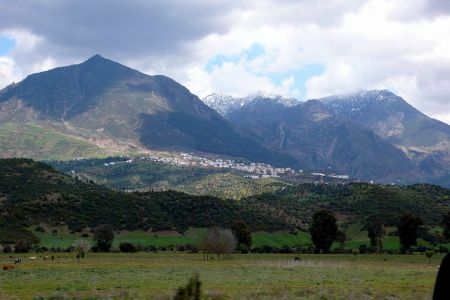 After your spa session you can also visit the village nearby before returning to Fes through a lovely rural landscape. Price: 60 €, entrance of spa not included (50 € per person). 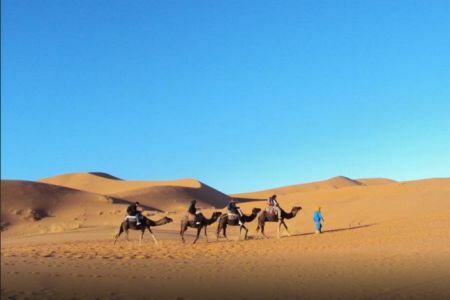 On this 3 days tour you will cross the mountains of Middle Atlas and discover the magnificent sand dunes of Merzouga during a camel trip in the desert. Your driver will pick you up at 7:30am at the riad and drive you through the cedar forests of Middle Atlas (Ifrane, Azrou). 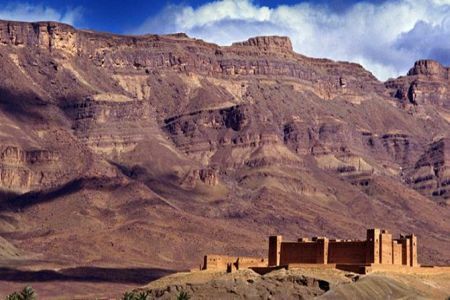 After lunch in Midelt famous for its fossils and rock crystals, you will head south through the dry, semi-desertic landscape of Tafilalet, reaching the great canyon of the Ziz Gorges dotted with lush date-palms oases, until the first sand dunes of Erg Chebi appear on the horizon. We will finally stop at a Kasbah guest house where you will spend the night. Here in the Sahara desert of Erg Chebbi, we stand up early and go on a drive through the sand dunes. While driving through this amazing landscape, you will see many black tents of nomads inhabiting this area. A stop by a nomadic family will let you appreciate the friendlyness and the hospitality of these people. You will discover the nomadic life of Berbers by visiting Khamliya, a village where time seams to be standing still. We will lunch in Khamliya and spend the afternoon there. In the evening, we go on a camel ride through the huge sand dunes of Merzouga, admiring the fabulous sunset in the fascinating landscape of the desert. Tonight we have dinner and stay in a Berber tented camp and enjoy the wonderful stars view of the night sky. DAY 3: MERZOUGA - MIDELT - IFRANE - FEZ. Today, we stand up early to enjoy the fabulous sunrise on the dunes then take a camel ride back to the guest house. After breakfast we will head for Fez. We will leave the Sahara, crossing the Ziz Valley and the Middle Atlas mountains and we reach Fez in the evening. Tours of several days are all inclusive (excepted drinks and tips). We of course can arrange tailor made excursions suiting your needs. Furthermore, our proposed tours can be also extended and/or modified. Please tell us exactly what you are expecting for, we will make an offer.